A forward operating base (FOB) is any secured forward operational level military position, commonly a military base, that is used to support strategic goals and tactical objectives. A FOB may or may not contain an airfield, hospital, machine shop, or other logistical facilities. The base may be used for an extended period of time. FOBs are traditionally supported by Main Operating Bases that are required to provide backup support to them. 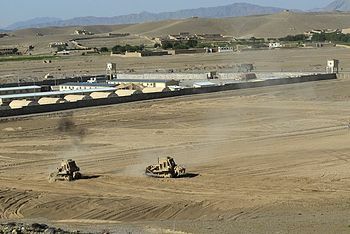 A FOB also improves reaction time to local areas as opposed to having all troops on the main operating base. In its most basic form, a FOB consists of a ring of barbed wire around a position with a fortified entry control point, or ECP. More advanced FOBs include an assembly of berms, concrete barriers, gates, watchtowers, bunkers and other force protection infrastructure. They are often built from Hesco bastions. ^ "forward operating base Official Definition (US DoD)". militaryfactory.com. Retrieved 10 April 2018. ^ "Army Logistician (Building a FOB From the Ground Up)". www.alu.army.mil. Retrieved 10 April 2018. ^ "Key Milestone in Troop Withdrawal from Afghanistan". British Forces News (BFBS). Retrieved 27 June 2014.